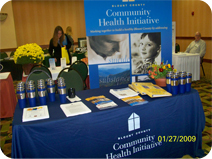 The Blount County Community Health Initiative is the result of a 1996 state mandate requiring each Tennessee county to develop a health council, which could address issues specific to the local community. The initiative is comprised of a steering committee, whose members include representitives from the Blount County Chamber Partners and the Blount County Health Department. The committee also includes each chairperson from the initiative's seven volunteer action teams. Click here to view a list of the 2018 CHI Steering Committee Members..
Blount Memorial Hospital, Blount Memorial Foundation, Blount Chamber of Commerce, Walmart, First Tennessee, ALCOA, Governments of Blount County, Maryville and Alcoa, Blount County Health Department and other interested partners supported this community-wide initiative to address the health needs of Blount County. The mission of the Blount County Community Health Initiative is to identify and prioritize the health needs of the community in order to respond to these needs and coordinate resources to promote a healthy community.